Discussion in 'Chit Chat' started by AnimeFrostyFreak671, Nov 9, 2011. I drink about 2 to 3 litres a day,not including coffee. Where I live the tap water is pretty good but I buy Buxton bottled water. Who can live without water? I don't drink a lot of water, I probably should. I want to install a filtered cold water faucet some day. I'm thinking of coiling up some pex into a small fridge then have it go to a under sink filter system. Instant fresh cold water. Right now I use bottled water (big bottles) but a tap would be more efficient and I'd probably drink more. Then again, there is some water in Pepsi, I just have to drink more of it! i don't drink water as i might rust !! but a Jack and a few cubes of ice is goo...... does it count as drinking water ? Be with me, but don't dare fall inlove with me..
@Red Jack You should install a filter. It's best to get the reverse osmosis filter though. Also, don't drink too much soda! WATER IS and ALWAYS WILL BE THE BEST DRINK EVER! 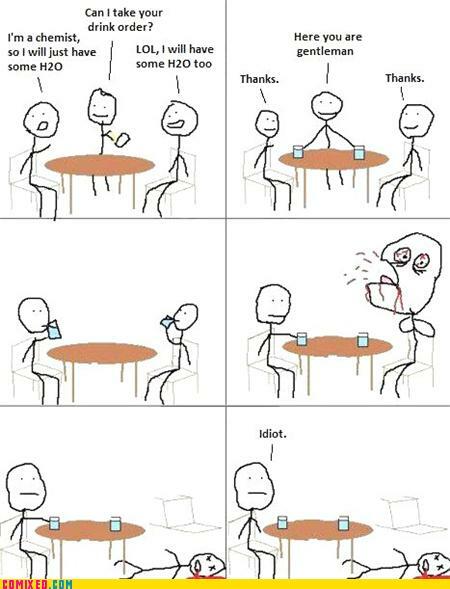 Hint for non Chemists: H2O2 is not good for your health. (To get the comic joke). I loled. It took me a while then it clicked. H2O too = H2O2. hahaha. Yeah probably bad idea to drink that stuff. H2o is also very explosive, in gas form, with a few minor modifications. Electrolysis is fun. Over 300 Pollutants in U.S. Tap Water! Be informed and spread the knowledge!